We decided to get Broccles a rabbit for his birthday. Being a rabbit himself, he’s a sociable beast, and we felt he could do with a companion to snuggle up with. The cats do not consider him snuggling material, owing to his tendency to enthusiastically mount them. We trawled the rescue websites, and Bunty fell completely in love with this startling-looking thing, which he remarked was the prettiest rabbit he had ever seen. However, the decision wasn’t Bunty’s to make. I called Fairly Beloved Rabbit Care and asked the administrator, Bunny Green, if we could arrange to take Broccles over to choose himself a companion. This struck me as a wonderfully civilized way to rescue animals – to place every single one into a caring home straight away. 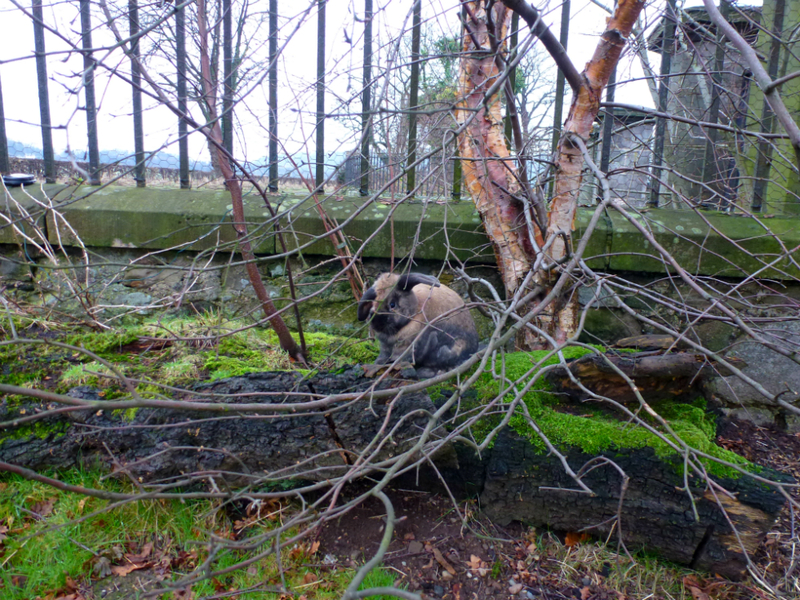 This foster network stretches across Scotland and currently cares for around 70 rabbits seeking Forever Homes. The logistics must be a gargantuan challenge. Obviously, this meant that Broccles couldn’t choose his own rabbit. Bunny suggested we select a couple of rabbits from the website, and these would be brought to our home to see what Broccles made of them. Bunty and I reviewed ones that might be compatible with Broccles, till we had a shortlist of 4 – including the whacky-looking one. You see what’s coming. The only one ready for immediate rehoming was her. Bunty was over the moon. Bunny recommended that we put the rabbits together in a cage or small enclosure, so that the confines would mean they would have to get along. I suggested the front porch, as then we could sit with them and separate them if they got too fighty. 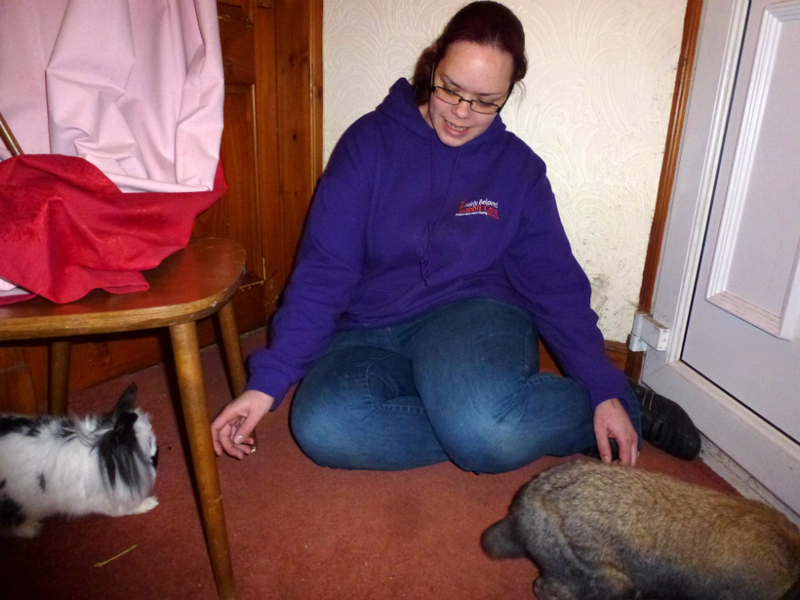 Bonding the rabbits. This lady changed her name to Bunny to raise money for Fairly Beloved’s fostering system. They didn’t get fighty at all. They veered away from each other, and Broccles, who is initially shy of all strangers, attempted to tunnel through me. After a few minutes, his ebullient nature resurfaced and he greeted Dorita. She nuzzled him back. 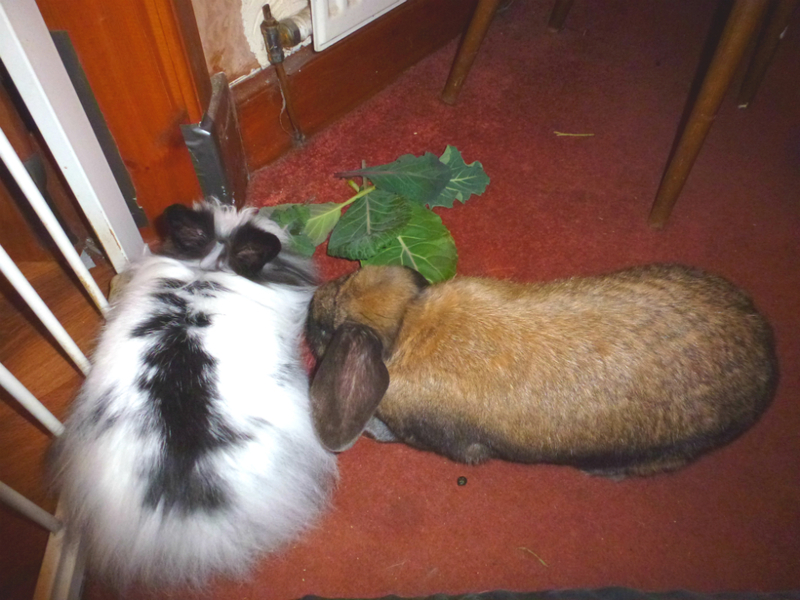 They ate a cabbage leaf together, and all was well. We signed the adoption form, paid a donation, and the superlative Bunny Green made her goodbyes, leaving us alone with our house full of animals. Broccles immediately decided to consummate his new friendship, and mounted Dorita’s head. Twice. Dorita took extreme umbrage and they had a big scuffle, then stared at each other in a sort of Mexican stand-off. Dorita grunted at Broccles, and stamped her foot in the International Rabbit Sign Language for “sod off”. Broccles considered this for several long moments, then stamped and grunted back. As though unsure what to do next, they carried on like this for about twenty minutes. I opened the door-gate. Dorita immediately explored the whole house, and established the bedroom as her kingdom. Once she was out of sight, Broccles went back to his usual routine as though she had never appeared. At 4 a.m., he flolloped into the bedroom, as usual, to snooze on the carpet near me. 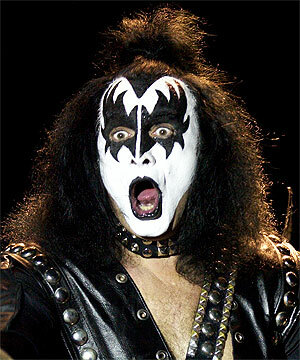 In the shadows under the bed, he came face-to-face with the rabbit equivalent of Gene Simmons. I was woken by wild under-bed scuffling that progressed to the living room. I got up to mediate. I found little Dorita standing haughtily in the middle of the floor, with Broccles backed against a book case, fluff sticking out all over his blind side. I sat and stroked them until they were calm and sleepy. Dorita returned to the bedroom and I went back to bed. Broccles has now realised that having his blind side towards someone doesn’t make them physically disappear. His irrepressible friendliness and her irrepressible curiosity means neither can ignore the other for long, and early the second morning I was again woken by their skirmishes. I stroked them again, and they moved their faces very close together. Dorita began grooming Broccles, starting with a thorough gentle cleaning of his missing eye region, and moving to his cheek, his forehead, and the insides of his ears. He melted into the floor, looking blissed-out. Then she oinked and chased him around the room. I think she will make his life very interesting. 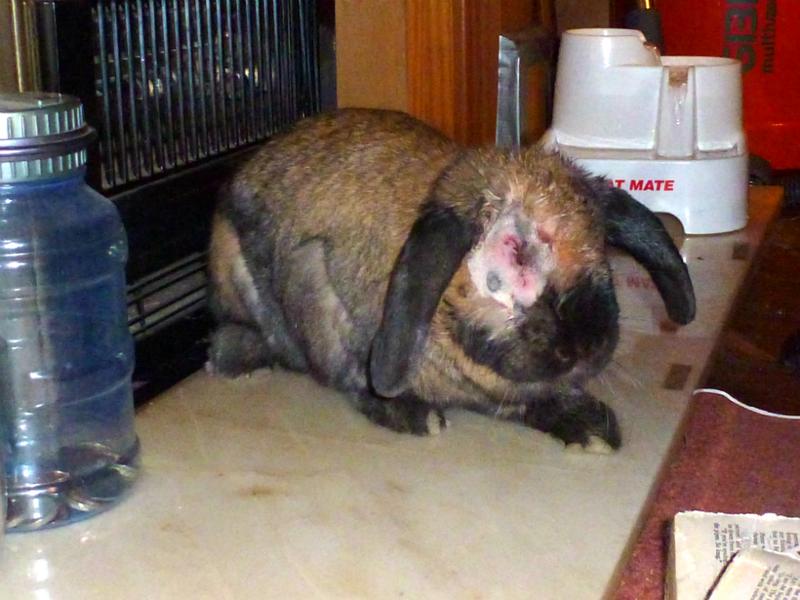 We were going to get our rabbit Broccles a girlfriend for Christmas, but instead we had his eye removed. Broccles has a talent for suddenly needing the vet during national holidays, and the money set aside for his new companion had to be diverted – and some. His blind eye had been shrinking, and in December his eyelid folded under itself and started scraping against his eyeball. This led to an infection. The vet knew that Bunty feels horrified about eyeball removal and the sewing-together of eyelids, so he suggested eyelid surgery instead. Broccles’s eye has led to so many vet visits, though, that Bunty and I finally felt he would suffer less if it were removed. 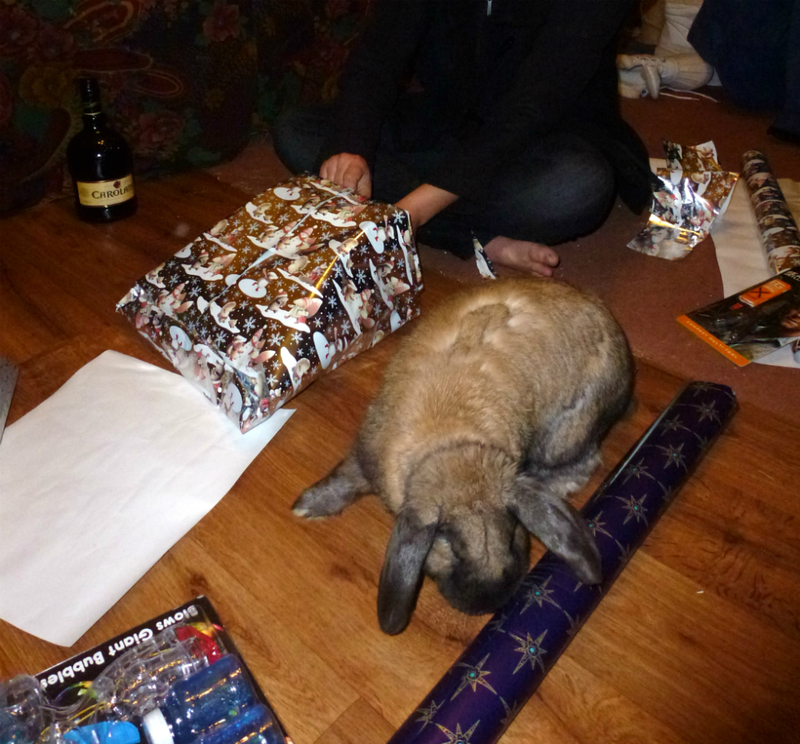 I made a point of booking Alasdair the Rabbit Hypnotist. All the surgeons at Broadley’s vet hospital are of the highest calibre, but my faith in Alasdair borders on the religious. As far as I’m concerned, he is a superhero of the rabbit world and I feel safest leaving our bundles of fur in his hands. Alasdair called us after lunch to say the operation had been a success, even though the shrunken state of the eyeball had complicated it. He called again when Broccles came round, reassured us that the bunny was fine, and warned us that his face might look a bit shocking. We collected Broccles once the post-op team was satisfied that he was safe to come home. His good eye was much wider than usual, and as as soon as we got back, he made a beeline for his Safe Place on the hearthstone. He looked a bit Frankenrabbit, but we thought Alasdair had done a fine job. Don’t you? I was given oral painkillers for Broccles – a disappointment, as he has a pathological terror of things shoved in his mouth. I’m always offered oral meds for him. I suspect this is because most pet owners are scared of giving injections and have no idea how much easier they are. Alasdair suggested wetting Broccles’s teeth with a drop at a time, and letting him lick it off – it was honey flavoured, and tasty to rabbits. I loved this idea. Unfortunately, Broccles wasn’t hungry after his ordeal, and he let the stuff drip onto the floor. He dug at the tiles in the way he does when he wants to be left alone, thankyouverymuch. I decided to have a go at hypnotising him into taking the medicine. Alasdair had once explained his method to me, and some of you readers have posted extra tips. I knelt down and lay Broccles on his back in my lap. His feet were braced against my tummy and his head and neck were secure in my hand. I murmured soothingly and stroked his forehead until he relaxed and went floppy. I slowly squirted the medicine into his mouth, and he drank it down calmly. Amazing! Thanks to everyone who helped me to master this new skill. A mere 36 hours later, Broccles was eating everything in sight, dancing around the cats, and showing no signs of pain. He demanded to be let outside, so against the advice of his nurse, I opened the door. 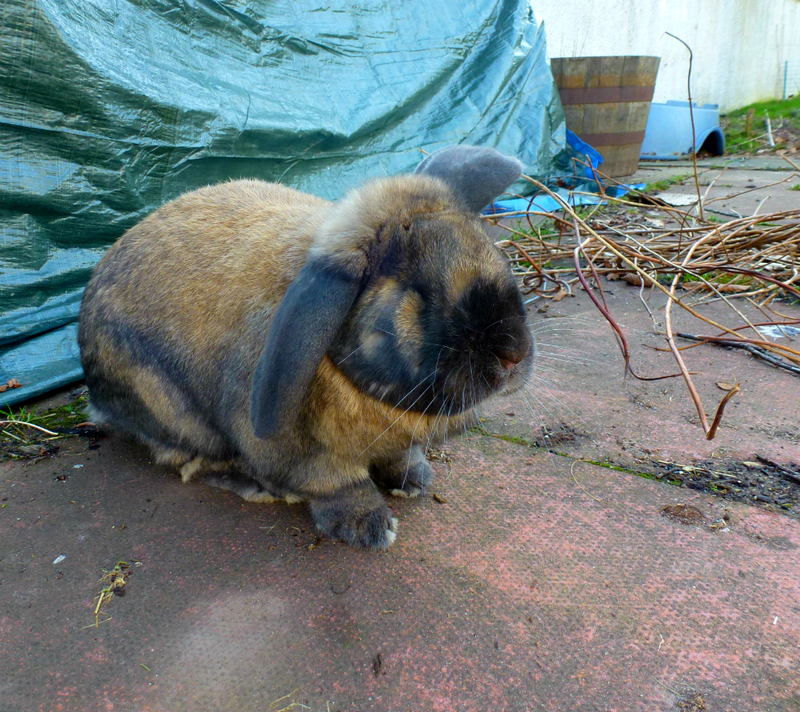 He enjoyed himself following Bunty around the winter vegetable beds. Then he seemed to lose his bearings. He got stuck in this tree for half an hour, until I came and guided him back into the house. For the next few days, he kept losing his way and bumping into things, and he needed encouragement to follow his usual routes around the place. He seemed much blinder than before his eye removal, even though several vets had assured us that his blind eye was completely blind. I had often had the peculiar feeling that he was looking through it, but this should not have been possible. When vets examined the eye with ophthalmoscopes, there was no sign of the retina at all. No retina means no vision. Broccles spent January relearning his way around. He has taken to following walls for guidance, and whenever he comes to a corner or doorway, he turns his head this way and that to examine the full layout with his single eye. He has been getting faster and more adept at this. He has come on, I may say, in leaps and bounds. His fur grew back rapidly, and it’s now difficult to notice that he has an eye missing. He is as handsome as ever, and in fine fettle for meeting a new girl. “How much is he drinking?” asked Alasdair (of Rabbit Hypnotist fame). I had no idea. Alasdair explained that if he’s not drinking lots, his urinary system is likely fine and he is probably eating more juicy food than usual. I was instructed to measure the water level drop in his drinking bottle. 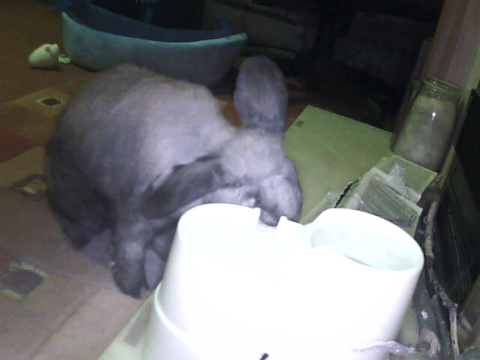 I explained that Broccles shares a water fountain with the cats, making it hard to judge how much he drinks. I said I’d keep him indoors and watch his drinking habits closely. Bunty had a better idea. He stuck an infra-red webcam near the fountain, and set it to email us a series of snapshots every time its motion detector was triggered. The computer also sounded a noisy alarm every time the fountain was approached by an animal. This meant we could check the screen and watch the animal without having to walk through to the living room. Broccles and the cats snoozed the long day away without having any drinks. In the evening, the alarm blared frantically over our TV show as a cat turned up for a drink. Ten minutes later, the other cat set it off. We couldn’t turn the sound off without muting our TV, which is Bunty’s computer. Ten minutes later, HOOONK! HOOONK! HOOONK! HOOONK! HOOONK! Broccles turned up, took a few sips of water and groomed his bib for a while. We paused our show and watched him benevolently. Ten minutes later, HOOONK! HOOONK! HOOONK! HOOONK! HOOONK! He set it off again. We carried on watching TV. 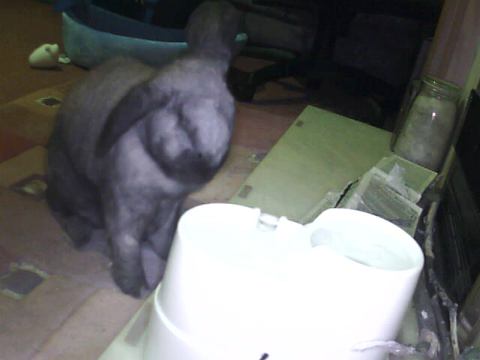 We knew what a drinking rabbit looked like by now. Ten minutes later, HOOONK! HOOONK! HOOONK! HOOONK! HOOONK! Every ten minutes through the evening and night, he set the damn thing off. I felt sure his kidneys must be disintegrating. Turns out he really likes to groom his bib. I called Alasdair and gave him the run-down. Alasdair said that, from my description, it sounds like he’s fine. He referred to the sipping and bib-licking as “wetting his cloth to use it”. We will continue to keep an eye on his drinking habits, but this time with less of the whole HOOONK! HOOONK! HOOONK! HOOONK! HOOONK! I have had it with sleuthing.